Isaac Heeney gets a handball away in front of Adelaide opponent Rory Atkins at the SCG. The contest could have been over at the first change had the visitors not kicked 4.9 in the opening term, but it didn't cost them in the end. Crows captain Taylor Walker kicked crucial goals and with Swan Lance Franklin well held by Daniel Talia at the other end, it inspired his team's win. What it means for Sydney: The Swans lost seven games at home last year and can ill-afford to make a poor start at the SCG on Friday night, especially after last week's disappointing loss to the Western Bulldogs. What it means for Adelaide: The Crows were widely tipped as premiership chances before round one and were shocked at home by Hawthorn. A 0-2 start to the year would be disastrous. How Sydney wins: The Swans' midfield was well beaten by the Dogs last week and Josh Kennedy, Luke Parker, George Hewett and Isaac Heeney will be out to make amends and get more ball to Franklin and his fellow forwards. 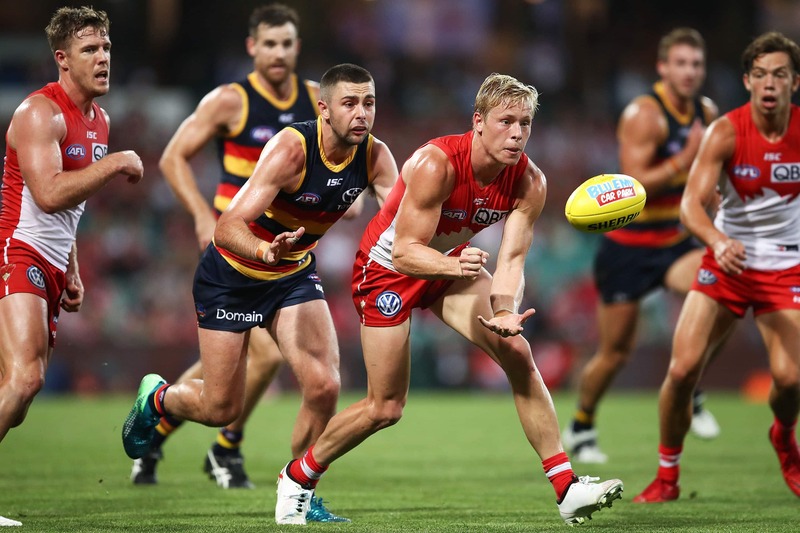 How Adelaide wins: If Daniel Talia and Alex Keath can handle Franklin and Sam Reid, and Rory Laird and Brodie Smith can get their hands on the footy at ground level off half-back, the Swans will find it hard to kick a winning score. The stat: The Swans were smashed around the footy last week against the Bulldogs, losing the contested possessions (151-125) and stoppage clearances (30-22), which resulted in them giving up 68 inside 50s, and only generating 47 themselves. Even with his severely limited preparation, Franklin is the man the Crows have to stop, and Talia has had success on him in the past. He's not likely to venture too far from goal again so Adelaide's midfield can't allow the opposition any freedom forward of centre, because if they can pinpoint Franklin, he can score from anywhere. The stopper will likely get the job on Adelaide co-captain Rory Sloane, who had 11 clearances last week to go with 36 possessions in a losing side. The Crouch brothers Matt and Brad, and Rory Laird could be other options, but Sloane is the heart and soul of the Crows and must be clamped. Big call: After spending most of the game forward last week, Isaac Heeney will return to the midfield and have a big influence with his fierce tackling around the contest. Mark him down for 30+ disposals and a couple of goals.